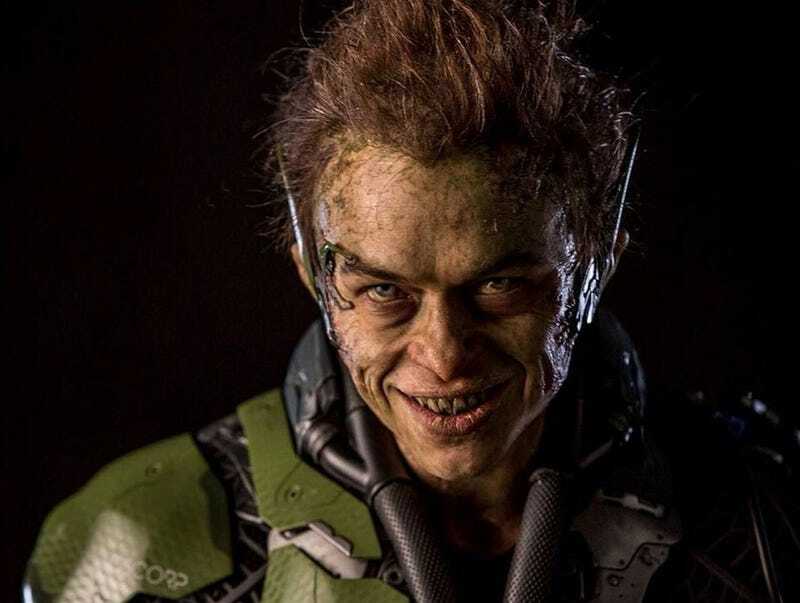 We've got an insane close-up of Dane DeHaan going FULL Green Goblin, and it isn't pretty. Apparently being the Green Goblin rots your teeth? But........ why? Now, to contrast, here is DeHaan as Harry Osborn in The Amazing Spider-Man 2. Look, he's all nice and tidy with his little trendy haircut and cute scarf. But then he becomes the Green Goblin and turns into what we see above? And apparently stops flossing. Honestly, the fact of the matter is we're going to watch Dane DeHaan in anything he stars in for (at least) the next four years. He's got that new character actor stink all over him, plus he was absolutely smashing in Chronicle, so perhaps DeHaan will become the standout villain in the Spider-Man sequel. You know, next to Electro, the Rhino and the 500 other bad guys they threw in there.